Amazon has launched a pair of new Kindle tablets; the 7-inch screen equipped Kindle Fire HDX and the 8.9-inch screen equipped Kindle Fire HDX 8.9. The new models are equipped with some big upgrades compared to previous models, including all the important stuff for a tablet; the displays, processors and cameras. Amazon has also upgraded the software so the core is now based upon Android 4.2 Jelly Bean. The best and quickest way to take a look at the new Amazon Kindle landscape is via Amazon’s own new feature table comparison which you can see below. 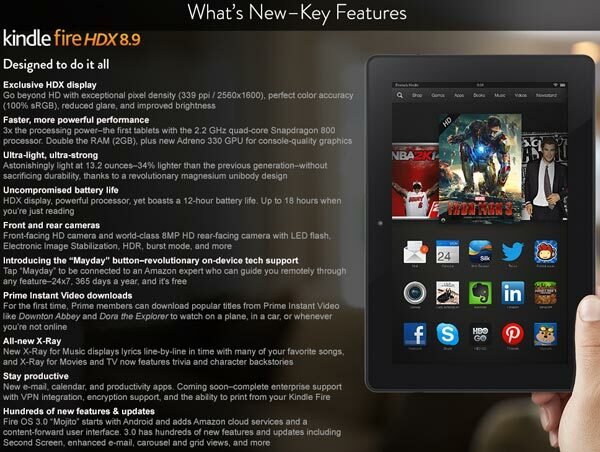 Here you can see the headline improvements given to both the 7-inch and 8.9-inch Kindle HDX tablets. The price is there too – as you can see these new tablets aren’t replacing the old but are like premium version offerings. 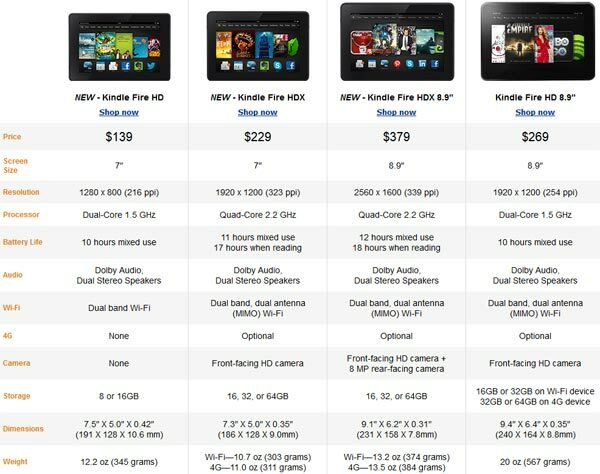 A quick glance through the table above shows that almost every aspect of the Kindle HD tablets have been improved on in the new HDXC series – at a price. 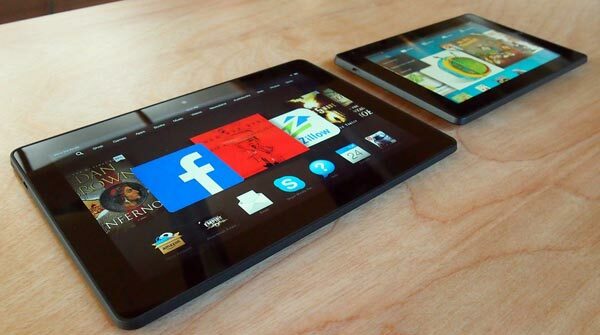 The new 7-inch tablet is heralded as being equipped with “The fastest processor on a 7-inch tablet”. The larger HDX 8.9 also uses the 2.2GHz quad-core Qualcomm Snapdragon 800. For graphics processing both rely on the Adreno 330 graphics chip. However, not mentioned in the feature table is another important upgrade, the HDX series are equipped with 2GB of RAM. The screens on the Kindle HDX and HDX 8.9 are also boosted in resolution to 1920 x 1200 (323 ppi) and 2560 x 1600 (339 ppi) respectively. Despite the increase in processor cores/speeds and pixel densities on offer both new tablets provide significantly better battery life, especially if just using the device as an e-reader. New camera functionality will also make these tablets more useful devices. In addition the new tablets come with more storage options, faster Wi-Fi and 4G connectivity options. 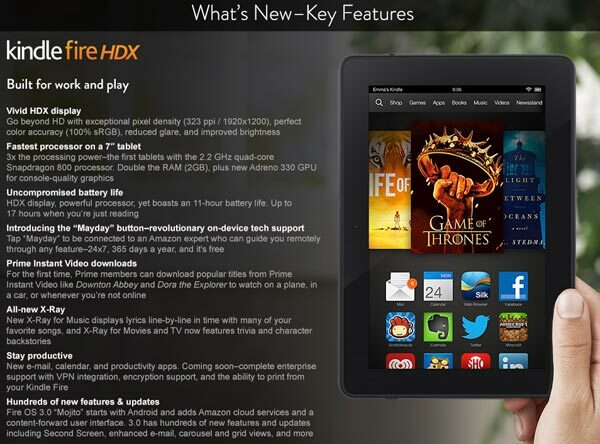 The HDX tablets also use an upgraded version of Amazon’s custom Android Fire OS dubbed ‘Mojito’, which is based upon Android 4.2 Jelly Bean. 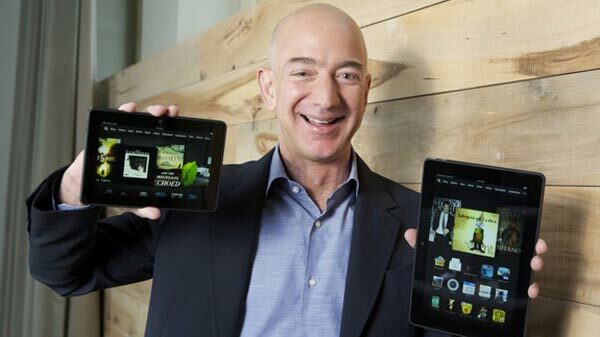 As part of the new software Amazon trumpeted a “revolutionary on-device tech support system” called ‘Mayday’. The Mayday service is available 24x7, 365 days a year at the touch of a button. You will be able to see an Amazon Tech Advisor (but they won’t see you) within a targeted 15-second response time with any of your tech queries. The assistant can “co-pilot you through any feature by drawing on your screen, walking you through how to do something yourself, or doing it for you—whatever works best”. This has been implemented because “You shouldn't have to be afraid of your device,” according to Amazon CEO Jeff Bezos. In the main table above you might also notice the Kindle HD flagged as ‘NEW’. Well Amazon has clad the Kindle HD in a magnesium alloy shell, like the HDX models, but it retains the same old internals. Its US price has also been drastically cut to $139. We don’t have UK prices and launch dates for any of these new Amazon tablets as yet. No SD/microSD slot to expand storage means no sale for me. I like to be able to slot in a 32Gb card into my nook with a few HD films on it for long flights, Kindle Fire will not allow that. Fixed memory (of a decent size) is acceptable to me for my Kindle, mainly because it'll take about 4000 books, which is vastly more than I actually need, even with my own PDF selection on it too. But for a tablet, I'm with you, no card slot = no sale …. even if your company happens to be a common fruit. You guys don't get it. If these companies allowed the customer to add more storage via SD card then nobody would buy the overpriced versions with more storage. We, or at least I, do get it. They offer a product I want at a price I'll pay, and I'll buy. But for a tablet, for me, doing without a card slot is as much use as doing without the screen. For me, it's simply a non-starter, and that's that. I get why companies offer feature-restricted products to protect the market of ‘premium’ devices. And don't care why they do it, merely that if they do it (by omitting the card slot) it's not a product that interests me. It's about what I need or don't need from a product. For instance, if buying a TV, I don't give 3/4 of 5/8 of a rat's dropping about whether it does 3D or not. If the basic model doesn't and the premium model does, I buy the basic. I wouldn't, literally, pay 50p for 3D. I might pay for Freesat HD receiver, but not 3D. I might well not buy if the number of connectors was too small, but don't care about 3D. I do need a certain number of connectors, and don't need 3D. I do need a card slot in a tablet, and without that, I'm not buying any tablet at any price …. unless it has a stupidly high fixed RAM, way higher than any current models. 16GB, 32GB, 64GB, whatever? Not enough. Start talking TB, at current prices, and like my Kindle e-reader, memory is sufficient that a card slot becomes unnecessary, but short of that, for me, no card slot simply equals no sale, no matter why they did it. Oh, and I'm not paying silly money for the premium products either. They aren't worth that to me, so I'd go tablet-less first. But the fact that other makers (Samsung, for instance) have tablets with card slots mean I don't have to choose between slot-equipped versus slotless, but between Amazon and Samsung. Hence, Kindle for an e-reader, and Samsung for a tablet, for me.